This mod allows creatures to catch fire from nearby burning objects and allows you to set them on fire directly with a torch or Willow's Lighter. Setting them on fire directly is still in development! 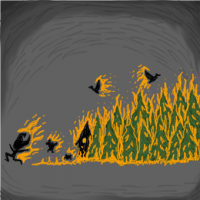 Currently, the only way to set them on fire directly is to hold a torch or Willow's Lighter with the cursor and click the creature you want to set on fire. Attacking a creature with a torch or Willow's Lighter now gives a 1 in 3 chance of setting them on fire! They can also catch fire from other burning objects, such as trees, grass or logs. Hopefully soon you will be able to set creatures on fire by right clicking them with a torch or lighter equipped. If you have any ideas on how to make this happen leave a message here. With a mod like this it's hard to know exactly how it will effect overall gameplay. From what I've tested it's a lot of fun but could also very easily backfire and lead to your own death or burn up most of your resources. In other words, seriously funny but not intended for serious gameplay. Extract the "firestarters delight" folder to your mods folder. Start the game and go to "mods" in the main menu. Select it in the list and click "enable". -Attacking creatures directly with a torch or Willow's Lighter now has a 1/3 chance to set them on fire!!! Old method of clicking the torch/lighter directly onto creatures still works, too. If you have any issues, suggestions or comments, please feel free to leave them on the forum.